I led a team of UX designers through a series of iterative design sprints. We designed a product that motivates middle-aged and elderly users to build a habit of engaging in more frequent interaction with friends. Recent surveys show that 2 in 5 American adults suffer from social isolation. Socially isolated individuals face health risks comparable to those of smokers. 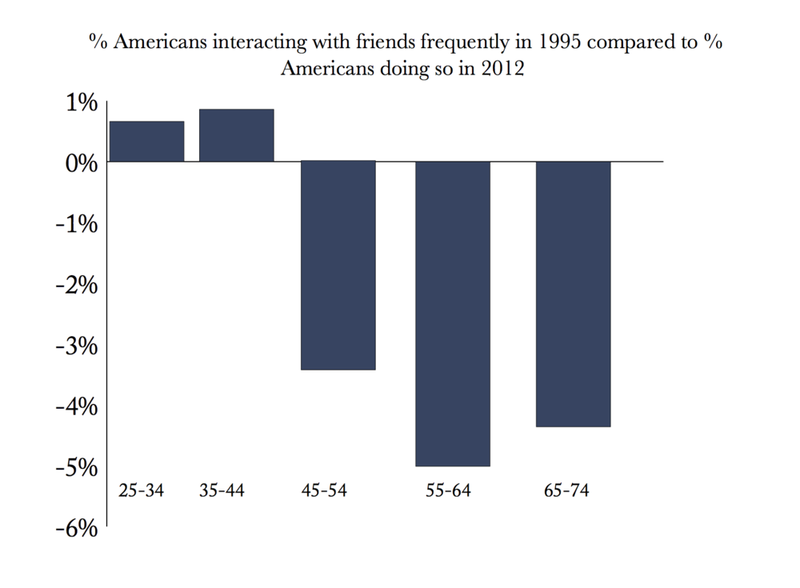 Adults in the United States between 45-74 have experienced the biggest decline in support from and interaction with friends, according to the Stanford Center for Longevity. Further study into the communication behaviors of this demographic shows that people in this age group prefer to communicate via texting messaging, and voice. There are 122 million Americans over 45 years; 18.4 million(15%) of these adults in the United States could stand to benefit from a product that address this problem. I led the team by designing quantitative and qualitative UX experiments, while outlining the product user story map. I set a hypothesis-driven precedent on the team by facilitating discussions of academic research that spans modern disciplines such as Human Computer Interaction, Social Psychology, Behavioral Sciences, and Media Psychology. These discussions helped the team focus on three major behavioral changes the product would help users cultivate: Self-Disclosure, Awareness, and Responsiveness. Our market research - powered by Google Surveys - provided an effective sample size of 302 respondents from which I drew insights, and tested key design choices made by the UX design team. Which of the following is the most likely to prevent you from reaching out to friends? b) are motivated to reach out to others by either ‘Seeing things that remind them of other person’ or ‘Knowing what to say/Having more to chat about’. This led the team to design a messaging app that would target users to communicate more frequently and more meaningfully with their friends based on their expressed need to ‘see things that remind them of others’ and 'know what to say’ . Using low fidelity prototypes left the designers more time to iterate on designs between, or even during, usability tests. I used standard industry practices such as think-aloud protocols and task-based user testing, while gathering instrumental qualitative information from users. In design sprints, I implemented quick low-fidelity prototyping techniques that allowed designers and users to focus on high-level interaction design and information architecture, rather than on details or visual style. "A messaging app that elevates the messaging experience by allowing users to collect moments together, creating a rich repository of memories to revisit." Tie differentiates itself in the market because it prompts users with memories that remind them of their friend; none of the messaging applications on the market work to make revisiting meaningful memories a centerpiece of conversation. We are currently in the closing stages of our design process. Please check back soon to learn about our progress. Thank you.